Tell USDA: Consumers should know where their meat comes from! We need your public comments to close a loophole used by meatpacking corporations to import foreign beef, slap a “Product of the U.S.A” label on it, and market it as American-grown. This outrageous practice misleads consumers, raises food safety concerns, and severely undercuts the market for real U.S.-raised beef. 75% of Americans indicate the source of origin of their food is a major attribute when making their food choices. 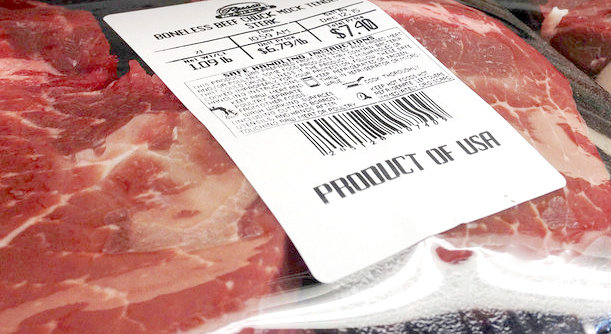 Fortunately, the USDA is considering a petition to ensure that “Product of the U.S.A.” labels are only used on meat that actually comes from the USA. This change would give America’s family ranchers a fair opportunity to market their products to American consumers who care where their food comes from and want to support products made in America. Learn more about how the current law is hurting American grass-fed beef producers in particular. You can help by submitting comments to the USDA by August 17, 2018. Writer’s Block? Your letter will carry far more weight if it’s written in your own words and is focused on YOUR reasons for caring about this issue. It can be as short or as long as you like. Is it important to you to buy from U.S. farmers and ranchers? Do you look for a “product of the U.S.A. label” and assume it means that the animal was raised in this country? Are you willing to pay more for domestically raised products, if you have confidence in the labeling? Have you struggled with the competition from cheaper imports? Have you had consumers bring up the price difference between your product and supposedly comparable products at the grocery stores (most of which are imported)? Have you had to explain to customers that the meat labeled “Product of the U.S.A.” may come from another country? Consider the irony: Australia is a leading beef exporter into the U.S. and has just implemented a mandatory retail Country of Origin Labeling requirement. That means Australian producers can get a premium in their own country from consumers who want to buy local and ALSO get a premium in this country from consumers who THINK they are buying from U.S. producers! Help us change the USDA’s policy so that American consumers can be confident in their choice to buy from American farmers and ranchers.